Duck Breast doesn’t have to be intimidating nor only for special occasions. As a protein it is on the more expensive side and you can be hesitant to spend the coin on a product you might mess up! I get it, that was me! There are a few key steps to ensure that you have a killer duck breast overtime. Set your duck out of the fridge for at least 30 minutes to allow it to come to room temperature. Room temperature meat cooks more evenly. Score the skin with a sharp knife in a crosshatch pattern. Cut through the skin/fat but not through the meat. This allows the fat to render with out over cooking the duck. Start in a cold pan. This slowly brings the duck to temperature and allows you to render the fat without burning the skin and overcooking the meat. Let it rest! Let your duck breast rest at least 5 minutes before slicing. This will redistribute all of the juices instead of them running all over your cutting board and leaving you with dry meat! Lastly, save that beautiful duck fat! Toss some fingerling potatoes in the reserved fat and roast them for a little bit of heaven that pairs perfectly with your duck! I decided to pair my duck breast with blackberries. 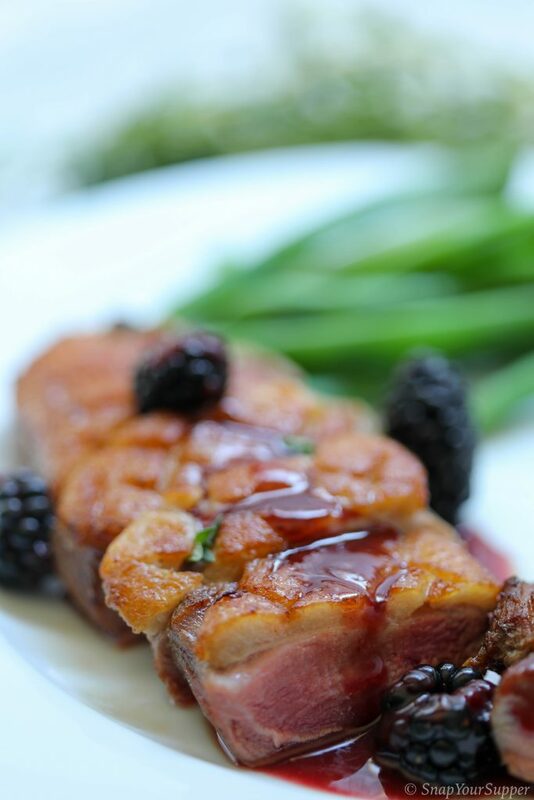 Duck pairs beautifully with a tart/slightly acidic sauce to cut the richness of the meat. I chose blackberries because they were the best looking berries at the market but use any tart fruit you like. Cherries are especially good. 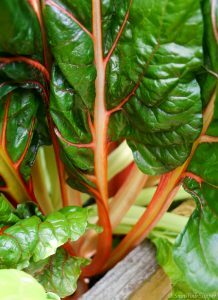 The ginger brings a nice spicy floral element to the dish and thyme is the herbal freshness you need. 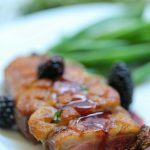 I hope you try my duck breast with blackberry ginger sauce and leave a comment to let me know what you think! 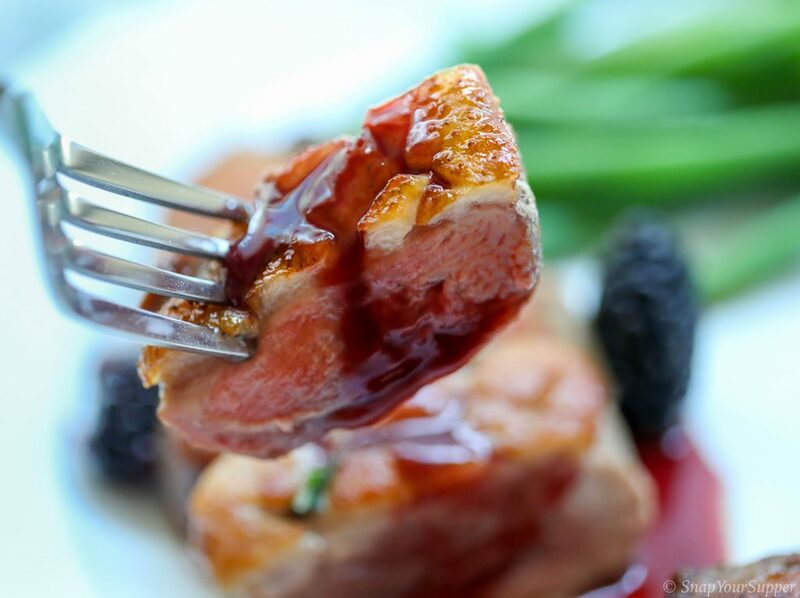 Pan roasted duck breast served with a blackberry ginger sauce. Score room temperature duck breast in a crosshatch pattern. Be careful not to cut through the meat. 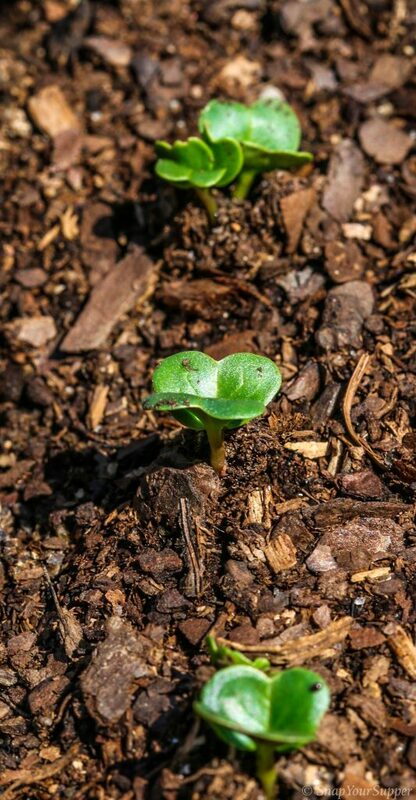 Season with 1/4 teaspoon kosher salt. Add olive oil to large sauté pan. Add duck breast skin side down to cold pan. Heat to medium heat and cook for 10 minutes undisturbed. Flip duck over and continue cooking for 2 minutes for medium rare 130 degrees. Remove from pan and let rest at least 5 minutes while you prepare the sauce. Pour off and save all but 1 tablespoon of the duck fat. Add shallots, ginger and thyme to pan. Cook for 2 minutes stirring so not to burn the shallots. Remove the pan from the flame of the range momentarily and add the brandy. Be careful as this may flame up. Return pan to medium high heat and stir to get all those brown bits up. Add chicken stock and 1/4 cup of black berries. Bring mixture to a boil and reduce to a simmer. Cook until liquid is reduced to half. Decrease heat to low. Whisk in blackberry jam,lemon juice & 1/4 teaspoon kosher salt. Strain sauce through a fine mesh strainer. To serve slice duck breasts and top with sauce. Garnish with sliced blackberries and serve immediately. Reserved duck fat is excellent when tossed with fingerling potatoes and oven roasted! The salt measurements are just guidelines be sure to taste as you go and adjust to your own magical tastebuds! Please be careful when deglazing any pan with alcohol. The result can flame up and I can’t be there with a fire extinguisher or be responsible for any injuries !